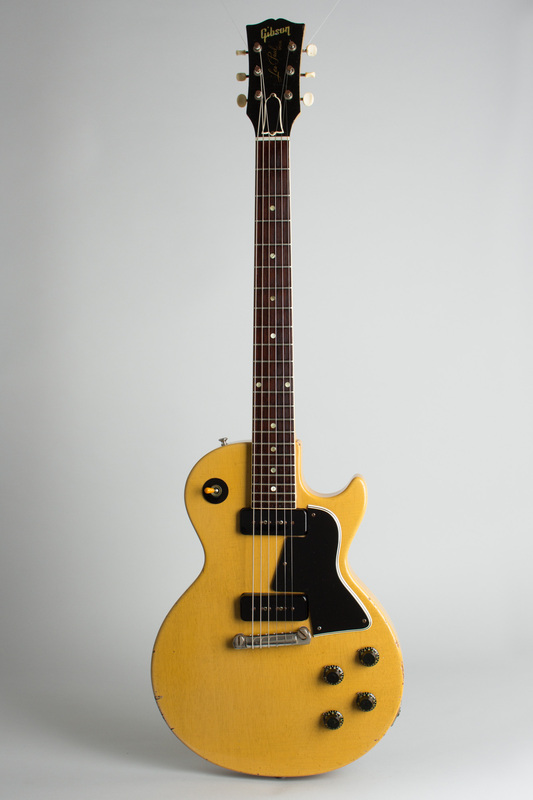 Gibson Les Paul Special Model Solid Body Electric Guitar (1957), made in Kalamazoo, Michigan, serial # 7-7019, limed mahogany finish, mahogany body and neck, rosewood fingerboard, black tolex hard shell case. This is a great example of a 1957 single-cutaway Les Paul Special, showing signs of play but in very good shape for just 60 years on. 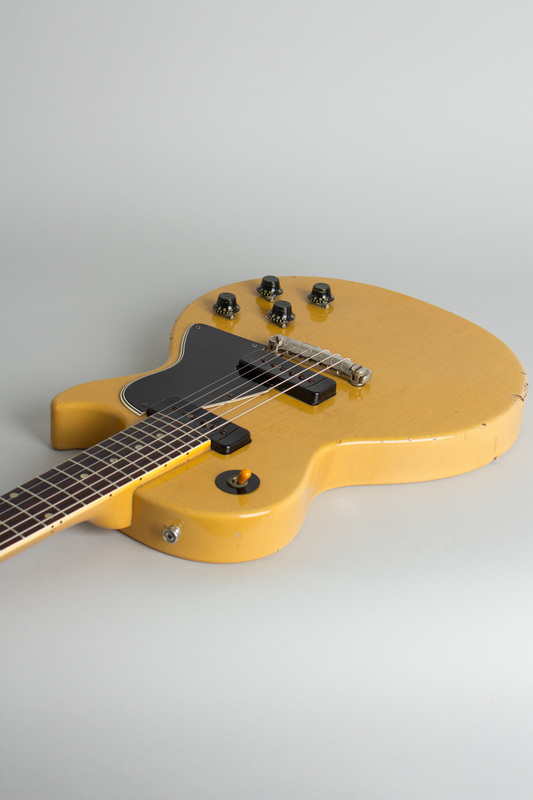 The features are typical of the first variant of this model with a "limed mahogany" finish on the body and neck, two powerful P-90 pickups with black plastic covers, black bonnet knobs, a multi-ply beveled-edge black celluloid pickguard, and the nickel-plated bar bridge/tailpiece assembly. 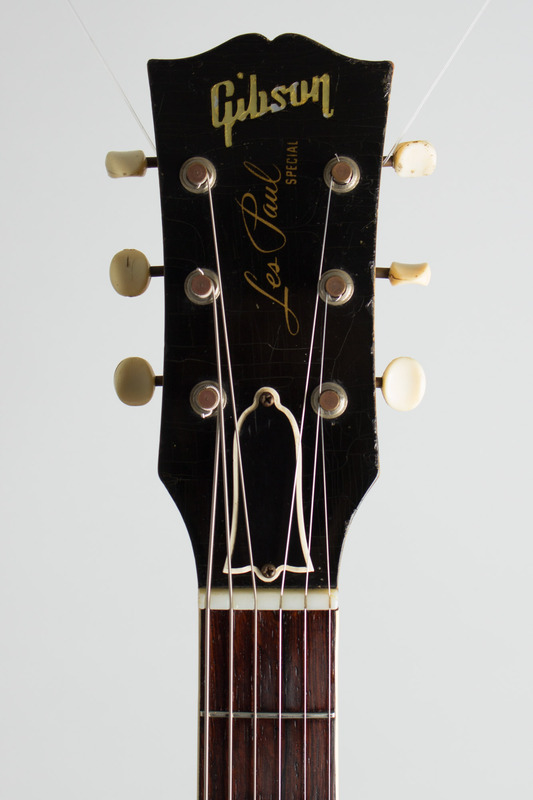 The headstock carries the pearl Gibson logo and silkscreen "Les Paul Special" designation. The original wiring is complete and intact including the much-loved "bumblebee" capacitors. 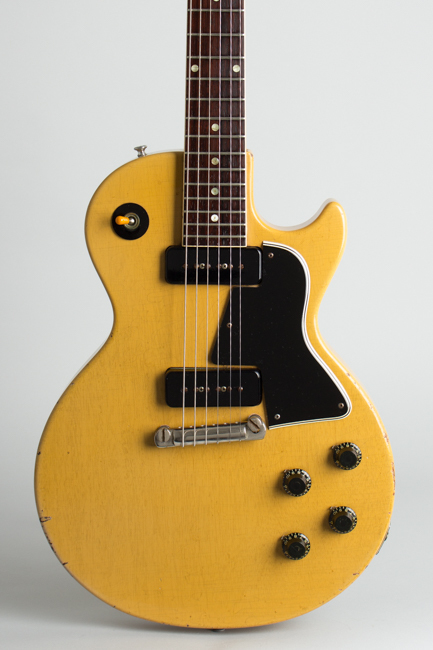 Although 1957 was a the peak production year for this model, only a total of 1452 actually shipped out; the LP Special is not nearly as common as the single pickup LP Junior which sold well over 3,500 units in several variations that year alone. 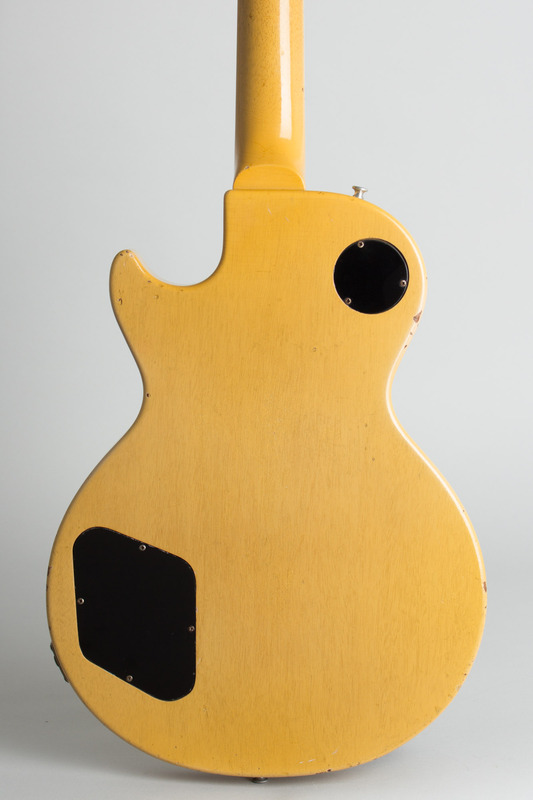 These single cutaway Specials are much more solid in construction than the double-cutaway version introduced the next year; many find the handling and sound more pleasing as well. This is a great all-around guitar, suitable for everything from rampaging Rock'n'Roll to hard blues and even twangy country. As the iconic Gibson solid bodies from the ever-longer-ago 1950s become more venerable, the original single-cutaway Special represents perhaps the greatest value in a "Golden Era" Les Paul. Overall length is 39 1/4 in. (99.7 cm. 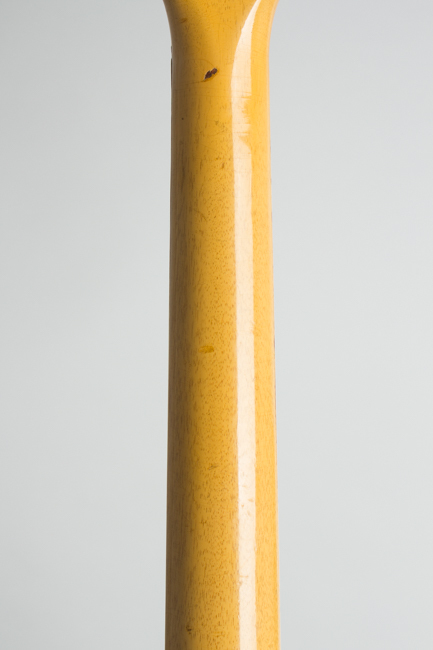 ), 13 in. (33 cm.) wide at lower bout, and 1 3/4 in. (4.4 cm.) in depth, measured at side of rim. Scale length is 24 3/4 in. (629 mm.). Width of nut is 1 11/16 in. (43 mm.). This Special shows just some typical light play wear but for its age remains quite clean overall and all original. 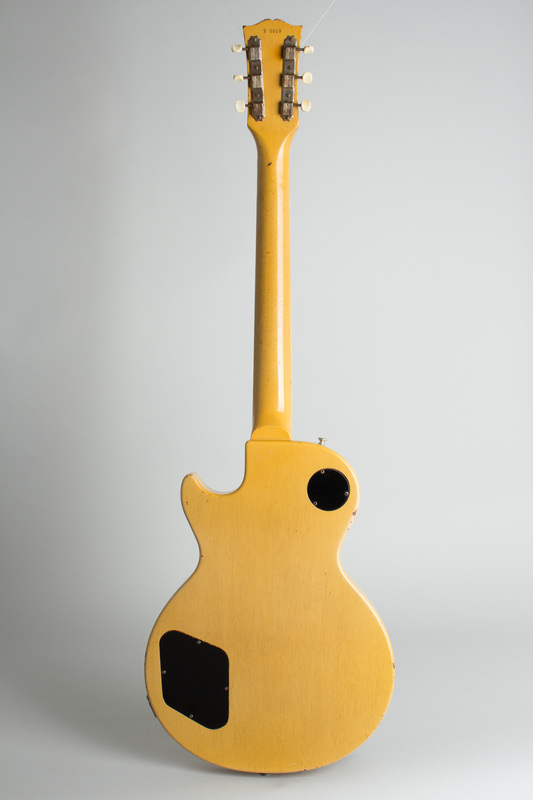 The TV Yellow finish is very well-preserved with the typical fine checking; it has retained the attractive "limed" shade ranging into pale yellow. It shows mostly just small dings, chips, and smooth wear spots on the face, back, and edges, most notably on the edge of the lower bout in the contact area under the player's arm. 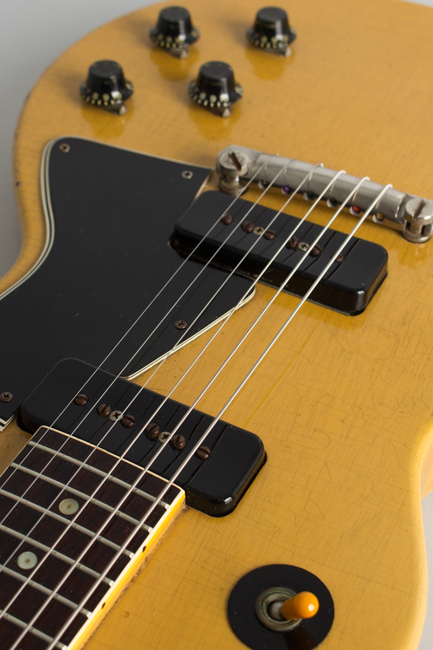 This guitar is also 100% original and unaltered, including the frets and all the hardware; the electronics are untouched with perfect solder joints and the "bumblebee" capacitors in fine fettle. 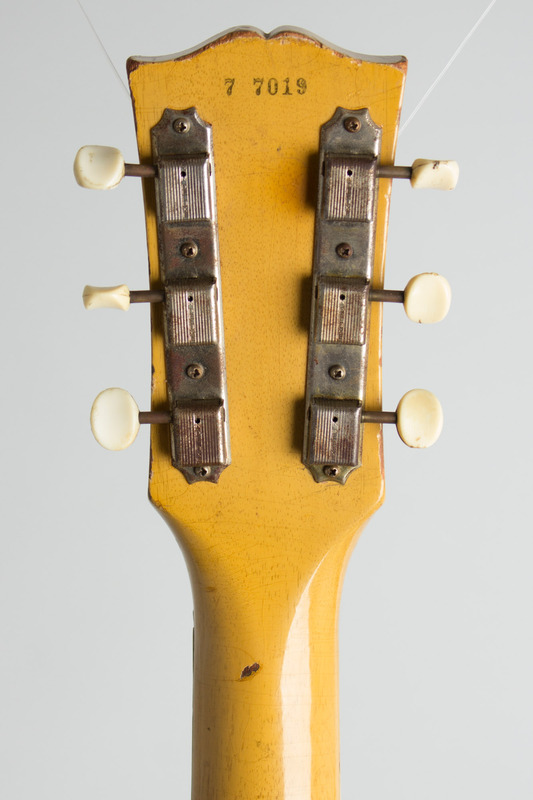 The thin black plastic jack plate is amazingly still original with one small crack (nearly all of them are broken by now), as is the plastic rhythm/treble ring on the selector switch and the amber tip. This Special plays great and has a very solid feel -- a bit heavier than some, but a very fine-sounding guitar. Excellent - Condition.